At work, I try to exercise during lunchtime, either by going to the gym, biking, or walking. When the weather is cool in the spring and fall, walking is the exercise of choice. 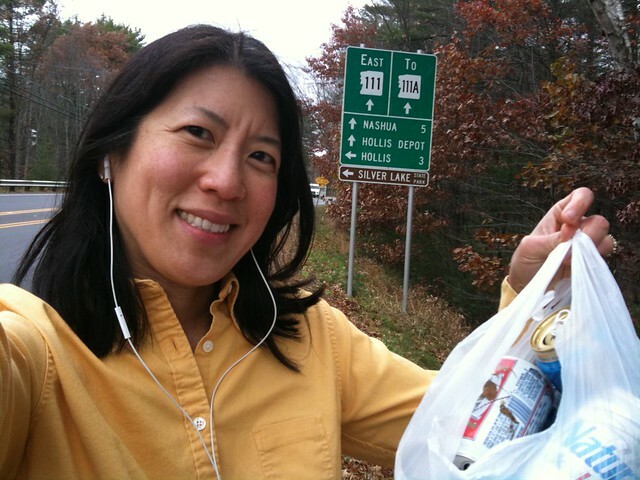 For years I walked in my iPod oblivion, but I would always notice beverage cans tossed by the side of the road. I always thought that one of these days, I ought to bring a bag with me and pick up the cans to recycle. 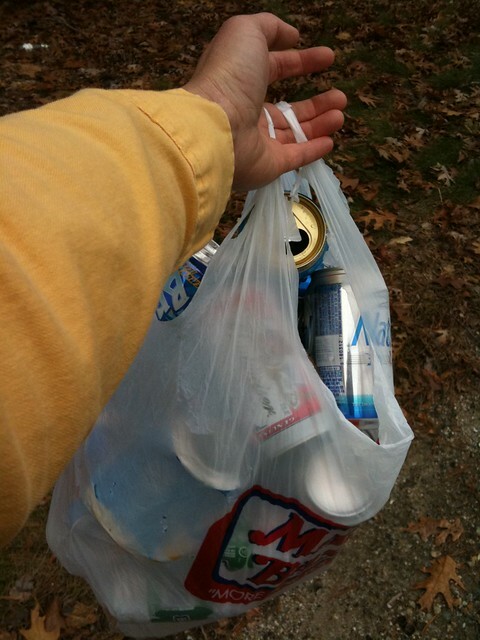 Last fall, I finally got it together and brought bags to pick up cans during my walks. The bags would fill up much quicker than I imagined, usually within the first mile of the walk. No matter how often I walked, there were always plenty of cans to pick up. A lot of the cans were half full, so I would empty them out before placing them in the bag. Sometimes, this was a pretty gross proposition, so I ended up wearing blue nitrile gloves for my walks. Ninety percent of the cans were beer cans, with an occasional soda or energy drink. I began to wonder where these cans came from. Some were grouped together, indicating a bunch of kids sitting around chugging beers. 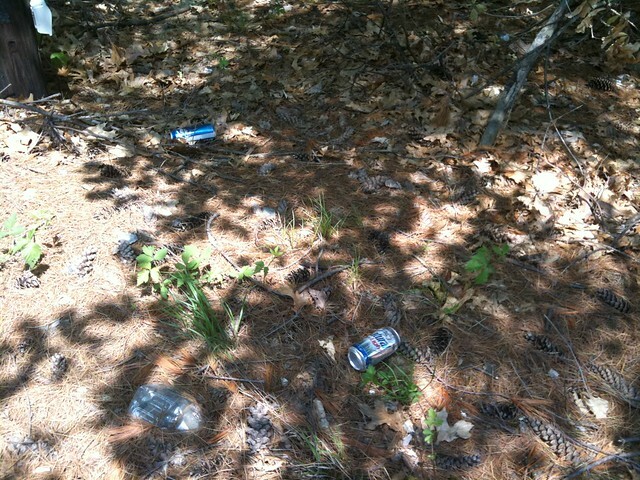 But the majority of beer cans looked like they were thrown right out of moving cars. Checking the Internet, only Mississippi allows driving with open containers of alcohol. It is certainly not legal in Massachusetts or New Hampshire, where I work. I asked some co-workers and sure enough, they knew others that drank beers on their way home and chucked the cans out of the window. In fact, those people celebrate then end of Daylight Saving Time, when that cops can’t see them drinking in the darkness. Well now, that’s news to me, no wonder why there are so many beer cans along the side of the road (more in Live Free and Die NH than MA, mind you). The very first time I walked back to work with a bag of beer cans, I was a bit worried about what people would think if I dumped a bunch of beer cans into the can recycling bin. I thought of leaving them in a recycling bin outside someone’s house, but that would be even harder to explain. I ended up dumping them in the work recycling bin, with a few co-workers looking on. Everyone thought it was a cool idea and I soon became knows as the “can lady” or “beer girl”. Even the general manager of our company stopped by and joked whether times were tough. He often asked whether I was going can picking when we ran into each other near lunchtime. Even people from my home town saw me picking up cans. I was that kooky blue-handed can lady, heading up a recycling revolution, cleaning up the environment, one can at a time! That’s 211 aluminum can tabs. Since then, I’ve learned from Snopes that the can tabs are hardly worth their time and energy. Basically, they say that you'd be much better off getting the full 5 cent redemption and donating that to your charity instead of the tiny fraction of a cent they get for the pull tab. At $427 for a million tabs, that is 0.000427 cents per tab, instead of 5 cents for the whole can. 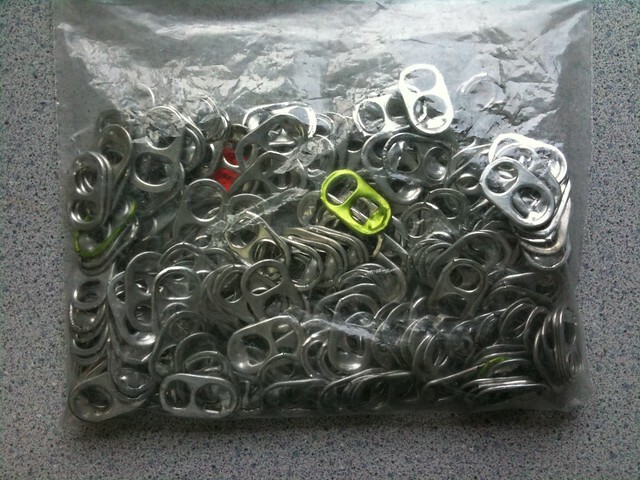 Still I liked to collect the tabs to count how many cans I’ve picked up during my walks. Is it enough to make a difference? Absolutely. Recycling just one aluminum can reduces waste—and saves enough energy to run a computer for three hours. Multiply that by 10—or 200—cans. Wow, my 211 cans can run a computer 24/7 for nearly a month! 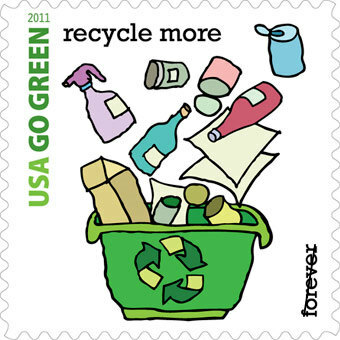 This spring, my recycling career came to an abrupt halt one morning when my boss approached me. He asked me whether I was the one recycling cans from outside in the cafeteria. I told him yes and that the general manager knew about it. But he said that there were complaints that beer cans in the cafeteria “were not appropriate”. Granted, the cafeteria didn’t smell like beer, but if you opened the lid and took a whiff, you could definitely smell it. But the cans were obviously from outside, they were soiled and dirty. No one is sitting around work drinking beers during off hours! Maybe I should just get people to stop drinking beers on their way home! If it’s not one crusade, it’s another. It must be hard to walk past the cans now. That's too bad that you can't do it anymore. And booooo on the state of Mississippi. What a shame that your green efforts were put to a halt. Watching people throw trash out of their car windows annoys me to no end.